Wands and Worlds: Don't overlook these books! This is a frighteningly believable book about a near-future conflict between a state and the Federal Government, with the National Guard caught in the middle. Exciting plot, credible and distinctive teen male voice, and well-developed protagonist. For anyone who has ever wanted to be Circus. 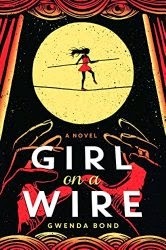 Part mystery, part circus story, and a bit of magic, this story of a young wire walker trying to overcome her family's past and prove herself is dripping with atmosphere and loaded with teen appeal. Federal agents investigating Washington DC prep school student Emily Bird may be more of a danger to her than the rapidly spreading global pandemic. An exciting thriller that shows the stark contrast between the power elite in Northwest DC and the working class in the Northeast, and the racism that exists in both. The conclusion of a terrific high fantasy series that started with Shadowfell. I've loved all the books in this series, but sadly I've been unsuccessful at convincing my fellow judges to shortlist any of them. With well developed characters, a page-turning plot, and themes of sacrifice and choice, this may be the best book of the trilogy. A creepy paranormal horror story told from the point of view of a centuries-old ghost. With distinctive voice, an almost poetic writing style, and a strong dose of Japanese culture, The Girl from the Well has a lot of teen appeal. This one came very close to making the shortlist, but we had some concerns about the mentally ill being used in a stereotyped way for horror effect. As the daughter of a dragon and a princess, Marni is torn between two worlds, the wild and beautiful but dangerous forest, and the equally dangerous life at court. A beautifully lyrical, character-driven fantasy with a theme of choice and being true to yourself.